Statistics can tell us a lot, and professionals who understand them are vital in almost every industry. For students looking to advance their careers in data analysis, pursuing a master’s degree in statistics is a solid option. As employment for statistics graduates grows, the master’s credential can give professionals the edge they need to climb the professional ladder and earn a higher salary. Earning advanced credentials in statistics can help set students apart while applying for careers. To help students find the best learning options for them, we have found the best schools that offer statistics degree as well as online learning opportunities. See which schools made the cut for our 2018 list below. Online students accepted to Texas A&M University-College Station can pursue an online Master of Science in Statistics degree with optional certifications in Biostatistics, Data Mining with SAS or Applied Emphasis. This 36-credit-hour degree is available 100% online. Students can begin classes during any semester throughout the academic year. Texas A&M expects applicants to have taken at least introductory calculus courses before applying. Prospective students should submit their GRE scores, a statement of purpose and letters of recommendation. Oklahoma State University has a 2-year online Master of Science in Applied Statistics for distance learners. This degree requires 36 credit hours of coursework, including Mathematical Statistics, Statistics for Experimenters and Experimental Design. This degree program prepares students to enter the scientific and data-driven workforce, not for further studies at the doctoral-level. While no thesis is required, the department has a mandatory Applied Master's Creative Component course in which students complete a satisfactory final project for their research committee members. Competitive applicants have a strong performance history in calculus, computer science and linear algebra courses. The GRE is required for admission. Colorado State University's online school offers a Master of Applied Statistics. Students in this program choose from specializations in Statistical Science or Data Science. Online learners complete 31 credits entirely online at $795 per credit. In most cases, students begin classes during the summer term and complete the degree within 1 year. Applicants must have a 4-year bachelor's degree from a regionally accredited university, including 3 semesters of calculus, 1 course in linear algebra and at least 1 statistics course. Students can take the Math Entrance Exam or the GRE for admission. The Department of Mathematics at the University of Houston has a hybrid Master of Science in Statistics and Data Analysis degree. Distance learners complete a total of 30 credits over the course of 1 calendar year. Students learn to analyze complex data and gain a foundational understanding of the field through hands-on assignments, research projects and a summer internship. Applicants should have a bachelor's or master's degree with a cumulative GPA of 3.0 or higher. Prospective students should submit their GRE scores, 3 letters of recommendation and a personal statement. Applicants with a background in probability and statistics are given admission priority. Located in the Division of Research, Graduate Studies and New Program Development, the University of Texas Rio Grande Valley offers a Master of Science in Mathematics. The program offers 4 concentrations: Statistics, Mathematics, Mathematics Teaching and Industrial and Applied Mathematics. Distance learners in this program learn advanced mathematical concepts and communication skills. Additionally, students concentrating on statistics can develop modern research skills to be competitive in the modern job market. Prospective students must have a bachelor's degree in mathematics or related field with a 3.0 GPA in all upper-level Math courses. Applications must include GRE scores, 2 letters of recommendation and a letter of intent. North Carolina State University at Raleigh has an online Master of Statistics degree for distance learners. This program prepares its master's students for popular careers in data mining and business analytics located at computer technology and software companies around the globe. Students can complete this degree entirely online by finishing 30 credit hours, or 10 courses, focusing on topics such as Statistical Programming, Experimental Statistics for Biological Sciences and Applied Nonparametric Statistics. Incoming students should have an undergraduate degree and experience in multivariate calculus and linear algebra. The GRE is not required for admission. National University has an online Master of Science in Data Science program consisting of 13 courses or 58.5 quarter units. Through courses like Data Mining Techniques, Advanced Analytic Applications, Database Design for Analytics and Advanced SQL Programming, students develop and hone their research skills while learning the essential analysis and evaluation techniques to be successful in a data science field. Online learners also complete a 3-month capstone project for graduation. Competitive applicants have a 2.5 GPA or higher. Those with lower GPAs may submit their test results for the GMAT, GRE or Miller Analogies Test to strengthen their application. Distance learners at Emporia State University can take advantage of its online Master of Science in Mathematics degree. Students in this program can focus on several areas of mathematics, including statistics, applied mathematics and algebra. By completing courses such as Complex Variables, Numerical Analysis and Regression Analysis, graduates of this program prepare to enter careers in various types of industries, businesses, governmental positions and teaching roles. Master's students must also pass comprehensive exams. Degree seekers can receive free assistance and academic tutoring through the Brighton Math Lab and have access to AfterCollege, a extensive job search engine to which Emporia has a membership. Prospective students can apply with an online application and their official undergraduate transcripts. No GRE is required for admission. 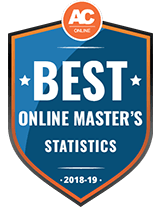 Students seeking a flexible schedule can enroll in the University of South Carolina's online option to receive a Master of Applied Statistics. Curriculum, which involves 30 credit hours of topics such as computing and statistical theory, helps working professionals to utilize statistics for the betterment of their organization. In order to graduate you will maintain a 3.0 GPA and pass a comprehensive exam. This grade average is also required for admissions. Additionally, applicants must possess a GRE score totaling 300. In as little as 10 months, students can graduate with a Master of Science in Data Analytics via fully online studies at Slippery Rock University. Following the completion of 33 credit hours, you will receive a certificate in statistical applications and data analytics from SAS Institute Inc., as well as be prepared to pass the Certified Analytics Professional (CAP) exam. Applicants must possess a 3.0 GPA in their undergraduate degree and hold a grade C or higher in prerequisite courses such as differential and integral calculus, probability/inferential statistics and programming languages. 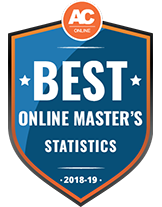 Students with a bachelor's degree in mathematics are eligible for admissions to the University of West Florida's online program to receive a Master of Science in Mathematical Sciences. Applicants must demonstrate GRE verbal and quantitative scores of 150. Courses, which are delivered through the web platform Blackboard Collaborate, utilize live conferencing to deliver lectures. Graduation requires the satisfaction of 30-31 credit hours, as well as the passing of 2 comprehensive exams. There are tuition waivers available for fully online students. Learners also have access to tutoring and advising services. Students bound for grad school in statistics often must take the Graduate Record Examination (GRE), and many also opt to take the mathematics subject test. The GRE Math test covers undergraduate-level math knowledge consisting of 50 percent calculus, 25 percent algebra and 25 percent additional topics questions. Prospective master’s in statistics students should request official transcripts from all previously attended institutions; these demonstrate that prerequisite coursework has been completed with an adequate grade. Special attention will be given to courses in math or related subjects. Transcripts may be sent either by mail or electronically. If you have work experience in statistics or a related field, ask your employer or another professional to submit a letter of recommendation. Undergraduate professors are another source for recommendations. Personalized letters that highlight a student’s achievements and qualities can help an application stand out. Some online master’s programs will request a resume or CV with your application. Make sure your resume is clear, consistent and relevant—it should highlight past achievements, credentials and experience that best showcase your fit for a statistics graduate program. To help defray the costs of graduate school, students may opt to apply for various forms of financial aid from federal, state and private sources. Gather records that detail your income and assets, and possibly those of your family (depending on your age), to demonstrate your financial situation and need. During the first year of a master’s program in statistics, students will complete the core coursework required for the degree, as well as begin selecting individuals to serve on the thesis or research project committee. Students will obtain approval for their projects during this year, and lay the foundation for the intensive work involved in completing it. First year courses typically include topics such as data mining, predictive analytics, probability theory and linear models. During the second year, students will complete their elective or concentration courses. Concentrations for statistics master’s degrees include areas like bioinformatics, data visualization, and data mining. In the second year students will also delve deeper into work on their thesis project; once it is finished, the student will present it to a committee of professionals or teachers. Examples of thesis topics include research in Bayesian modeling, statistical approaches to real-life phenomena and stochastic processes. Prior to graduation, online students will take their comprehensive exams to demonstrate they have acquired the necessary knowledge from the master’s program. The exam may be in the form of a written test, an essay or an oral exam. Students should begin studying for these exams early in their academic careers, typically starting in year one. The thesis or capstone project is a multi-semester project which will dominate much of the student’s time and efforts. It should contain original theories and research by the student, and will usually involve large-scale data collection and analysis. It may also involve an internship or practicum with organizations affiliated with the program. Students learn to use and develop methods and software for understanding biological data. Subjects of study include computer science, mathematics, statistics, engineering and biological sciences. Applies mathematics and statistics to different areas of biology in order to make advancements in the industries of health and agriculture. Designs biological experiments and then collects, analyzes and distributes the findings. Assists in the development and testing of new drugs prior to public release by applying statistical techniques and methods throughout the stages of research, development, testing, marketing and distribution. Uses statistical techniques to collect and analyze health data at the community, state and national levels. Reports on findings to help in developing new public health policies, wellness programs, and methods for raising public health awareness. Uses statistical methods in many facets of computer science such as data mining, machine learning, software engineering, speech analysis and image analytics. Often works for government agencies on a state or national level. Creates statistical experiments and uses data analysis to study natural resources, farming practices, animal tracking and more. Works in a private or public school setting, typically on a university level but sometimes for high schools, teaching students the principles of statistics and preparing them for further education and careers in the field. Students investigate algorithms currently used in finance, learning to interpret data as well as use and develop computer programs that realize financial models or systems. Analyzes financial data and identifies trends in various financial markets such as those for credit, stocks or housing. Such analyses are used to help professionals make investment decisions, develop software, or price products. Analyzing and translating data to visual contexts is the focus of this track; because data trends in a text format can be difficult to identify, students also learn to read, recognize, and project data. Typically works for manufacturing or industrial companies to help design, manufacture and market products. May use statistical algorithms to predict consumer behavior and create quality assurance models. Students examine and analyze large databases in order to generate new information and identify patterns and trends. Works for various governmental agencies concerned with establishing and carrying out national policy. Statisticians in this field design experiments, develop computer simulation models, and research budget allocation methods. Work for the census bureau to collect and analyze data about practices and trends in population demographics, housing, agriculture, business and transportation. Designs survey samples and methodologies, analyzes measurement errors, and assesses survey quality. From simple computer programs to robots to self-driving cars, machine learning is a major part of today’s technological world. In this concentration, students explore pattern recognition and computational learning theory in artificial intelligence. The U.S. Bureau of Labor Statistics considers a master’s degree to be the minimum qualification needed for a job as a statistician, mathematician or survey researcher. Therefore, a master’s degree in statistics automatically opens up new potential career paths to those who earn it. It also translates to a higher salary. Statisticians and biostatisticians make $79,990 a year, mathematicians make $103,720, and survey researchers make $49,760. Compare these figures to jobs requiring only a bachelor’s degree, such as social science research assistants, who make $39,460 a year, or statistical assistants, who make $42,070. As a nonprofit, ASEE is a member-run organization that works to promote and improve engineering and technology education. ASIST has over 4000 members who are professionals and information specialists in computer science, linguistics, management, engineering, medicine, chemistry and education. The society works to develop theories and find techniques and technologies that will improve access to information. The ASA supports excellence in the development, application and dissemination of statistical science. Its website includes information about meetings, publications, membership services, education, accreditation, and advocacy. ACM is dedicated to advancing science, engineering and information technology. With chapters and members worldwide, AWC works to promote the advancement of women in computing. Their members include professionals such as programmers, system analysts, operators and technical writers. IASS promotes the study and development of theories and practices for creating sample surveys. A resource for individuals in computer science, computer engineering, and related fields, the CRA works to strengthen research efforts and advanced education in the computing fields, expand opportunities for women and minorities, and to conduct policy work. COPAFS is a network of educators, researchers, public health professionals, civic groups and businesses who rely on statistics that are collected by the national government. Find Online Statistics Degrees Masters Programs with the accreditation and affordability you need with our complete database of schools.